The Jerry Garcia Foundation will produce its third "Imagine There's No Hunger" benefit concert in support of WhyHunger and Yoko Ono Lennon's global hunger relief efforts. once again honored to announce that it will be producing its third annual "Imagine There's No Hunger" holiday benefit concert in support of WhyHunger and Yoko Ono Lennon's mission to alleviate hunger and poverty worldwide. The "Imagine There's No Hunger" program draws inspiration from the iconic song Imagine written by Yoko Ono and John Lennon and based on the writing in Yoko's book, Grapefruit. The "Imagine There's No Hunger" concert audience will be invited to participate in sing-along presentations of Lennon's Imagine, Give Peace a Chance, and the Grateful Dead's Ripple. This year's production will be presented at 7 PM (doors open at 6:30) on December 16th at the picturesque Viansa Sonoma Winery located in the San Francisco area. Door proceeds benefit WhyHunger. 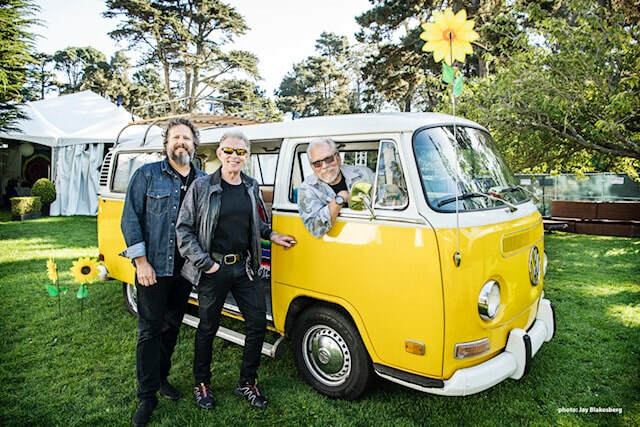 Hot Tuna is headlining the benefit concert featuring Grammy Award-winning artists Jorma Kaukonen and Jack Casady and drummer Justin Guip. Hot Tuna, Jorma Kaukonen and Jack Casady perform with a well-honed and solid power -– always in the groove derived from years of experience and mutual inspiration. What started as a side project during their Jefferson Airplane days, Hot Tuna's constant has always been Jorma Kaukonen and Jack Casady, the very definition of Hot Tuna. The two boyhood pals have never wavered in one of the most enduring friendships in Rock history. "Hot Tuna is a Psychedelic-Blues Institution" – Rolling Stone Magazine. 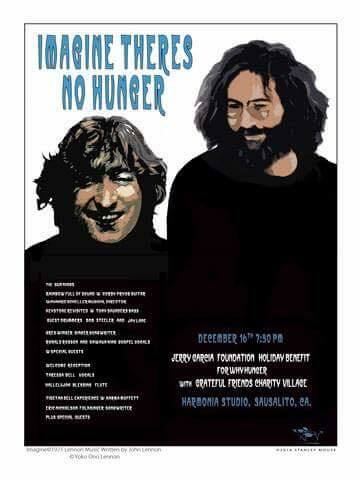 "The Jerry Garcia Foundation is honored to present the 'Imagine There's No Hunger' benefit concert to support the important humanitarian work of Yoko Ono Lennon and WhyHunger. We are grateful to Hot Tuna, the Viansa Winery and to all that have extended their generosity on so many levels," said Keelin Garcia, Co- Founder of the Jerry Garcia Foundation. "The Imagine spirit of generosity is a blessing and a gift to the greater community," added Manasha Garcia, Jerry Garcia Foundation Co-Founder. The benefit's setting itself is where dreams are made. Located just north of San Francisco, Viansa Sonoma winery is situated on 33 acres of estate vineyards, 97 acres of natural wetlands with 270° views of the Sonoma Valley-San Pablo Bay, Mayacamas Mountains and "King's Highway." The beauty of the land pairs perfectly with the beauty of giving. The visual art of Jerry Garcia will be on exhibit in the Grateful Friends Charity Village at the concert. All art proceeds benefit California Wildfire recovery efforts via the "Heart of the Vine" Foundation. Ben & Jerry's® and Levi's® are sponsoring this year's holiday benefit. Levi's® has donated a sustainable Trucker Jacket inspired by Jerry Garcia's fine art. Proceeds from the Levi's® Truckers Jacket will benefit WhyHunger. Rock poster artist Stanley Mouse has created a benefit poster for the art/music event. Mouse has produced art for both the Beatles and the Grateful Dead. You are invited to join us via Live Stream for a Holiday Concert at the Harmonia Yoga Arts Studio on December 16th to benefit WhyHunger. Inspired by John Lennon, Yoko Ono and the song, "Imagine," the "Imagine There's No Hunger" campaign endeavors to turn the dream of a world without hunger into a reality. The Jerry Garcia Foundation is donating a collection of Garcia's visual art to the WhyHunger organization. Select pieces will be on exhibit at Harmonia on the night of the concert as well. All proceeds generated from the concert and fine art will support the WhyHunger mission. The concert will be presented at Harmonia, located in the former Sausalito Record Plant recording studio. The Record Plant is legendary in the music world and the building has been minimally renovated to preserve its historic integrity. Countless luminaries have graced the studio's doors. In October 1972, John and Yoko attended the Record Plant's masquerade party opening celebration, dressed as trees. and the New Riders of the Purple Sage. *The Grateful Fiends Charity Village, an information sharing area designated for guest nonprofits will be featured in the Garden Room at the concert. Playing for Change Foundation, and Save the Bay. The Art of Jerry Garcia will be on display at the Psylodelic Gallery at the Fur Peace Ranch Center for Art and Culture in Pomeroy, Ohio from April 7 through November 2016. We are honored to support the The Grammy Foundation's ﻿﻿MusiCares program with a gift grant of Jerry's fine art.